Discussion in 'Equipment Reviews' started by Andy006, May 16, 2010. Well I haven't done a review for a while and used to do quite a few on the BBS prior to my life time ban by TD for discussing AT, but I fancied doing one on my new Ripley Elite because I am so chuffed with it. 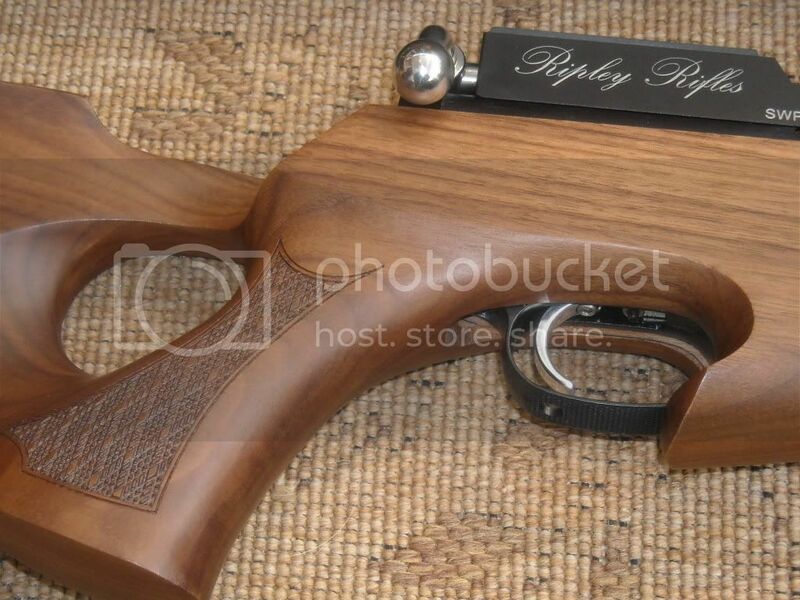 When the Ripley was first announced way back in 2007/8 as the Ripley Hog, I wanted one. I just loved the chunky looks and carbine shortness. The rifle looked special to me and with it being all British (except for the german barrel ofcourse) I was even more keen to get one. I like the fact that this rifle is produced by an almost cottage industry type of setup and that they are primarily hand built in Yorkshire. I love Yorkshire so that made me want one even more. 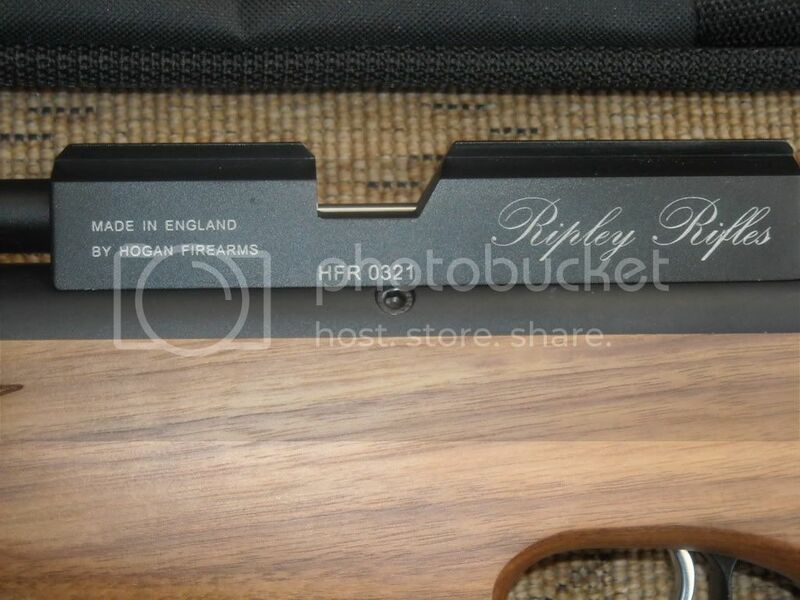 It was about this time last year where I made my first enquiries into purchasing a Ripley Elite and I emailed Hogan Firearms and Highland outdoors many times in order to gain as nuch info about these rifles as possible. I decided to save my hard earned cash and by selling a few other bits and bobs I slowly made up the cash fund needed. 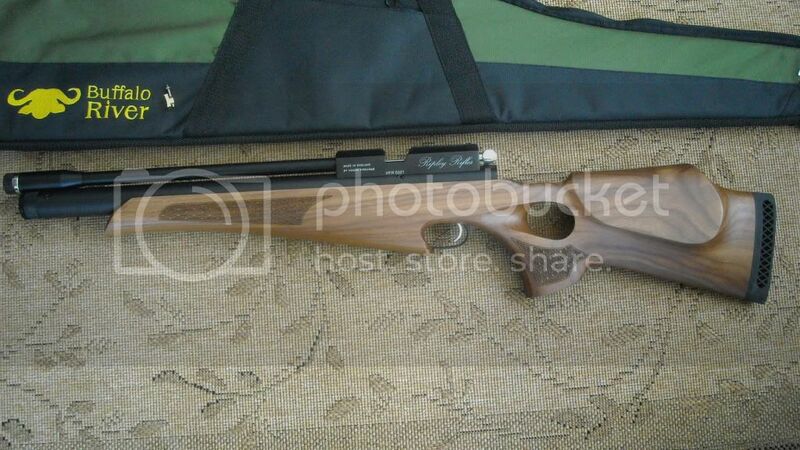 So a few weeks ago I decided that the time was right and I decided to search the dealers to find a Thumbhole walnut stocked version in satin finish at a good price. I found one dealer in Cheshire able to sell me one for £615 quid, excellent I thought. Thats a good saving on most places for the Thumbhole version which usually retail for about £749. But that still required me to pay extra for the RFD to RFD transfer. I then decided to ask my local dealer (MGR guns) if they would do the RFD transfer bit for me at which point he said that he could order the gun for me and price match. Wow says I, cheers. Not only did he price match, but actually beat the price and I ended up paying £610 pounds. The gun was delivered to the dealer 2 days later and off I went to pay and collect. At this point I had already emailed Hogan Firearms and asked them what the chances were of coming to the factory and swapping my new stock for a nicer one. They said no problem. Good on em. So I went to collect my new Ripley and when I saw it, I quite liked the stock but it was a bit too light coloured for me. The standard trigger is quite nice to look at, but no where near as comfortable as the match trigger, but more on that later. The rifle comes with a 3 year warranty with free courier collection and delivery if anything goes wrong. Pretty good I think and that shows how confident Hogan Firearms are with the quality of this rifle to offer such a good guarantee. So first impressions over and I quite like the look and feel of the rifle. Infact it is very similar to my GML Hunter but with a more solid, chunky feel. 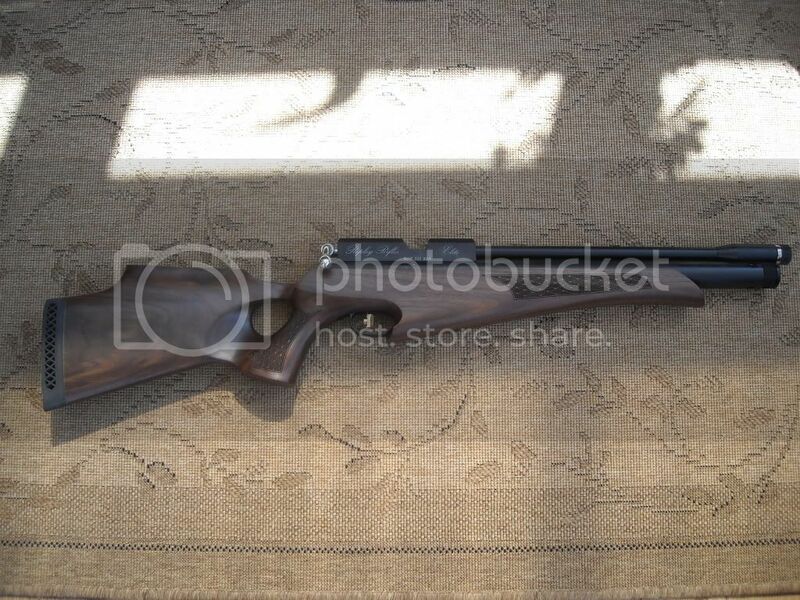 It feels tough and it looks tough in a butch sort of way for a sporter air rifle. 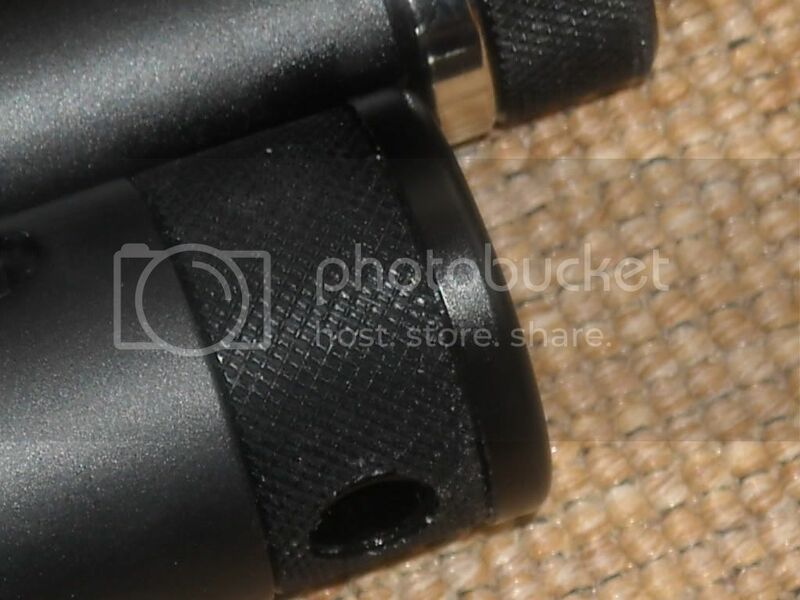 The satin finish I chose is very nice and the finish looks and breathes quality. 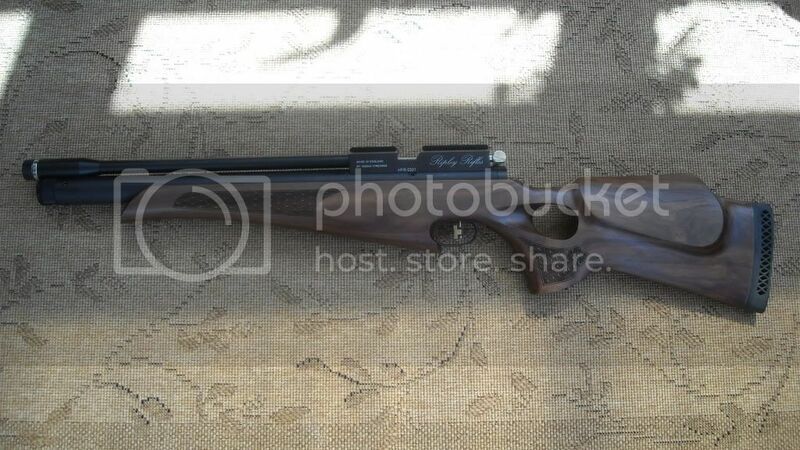 I also purchased a Hogan Decimeter Silencer for shooting in my garden and to be honest, all you can hear is the hammer spring on firing. Really, really quiet. But I take the silencer off for testing and shooting HFT. The filler port is accessed via the knirled cover that rotates very smoothly to reveal the hole where the brass filler probe is inserted. The recommended fill is 200 bar. But I fill to 180. Right, the first thing I did was chronograph this beauty and thats where I became deflated. The rifle was outputting Webley Mosquito 4.52's at a measly 10.3 ft lbs. Nowhere good enough for what I wanted. 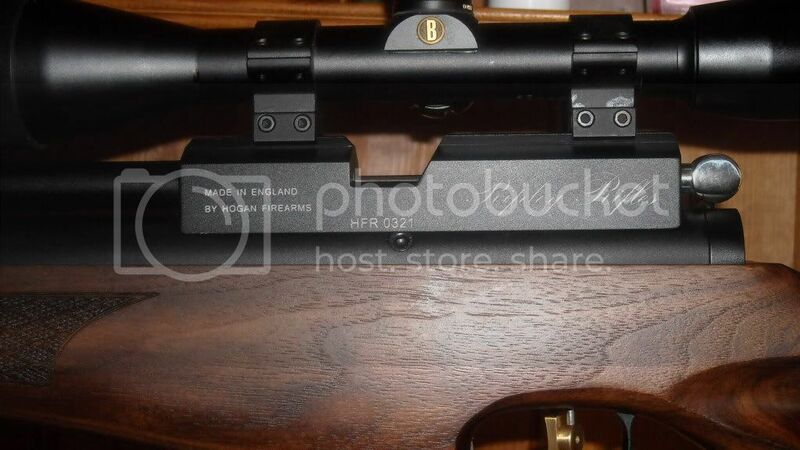 But this rifle being sealed with anti tamper shear off bolts and caps, I couldn't do anything to change this. I tried 8.44 gn JSB's through it too and the output was even lower. Not good enough. So I decided to make the journey to the factory to kill two birds with one stone. They could adjust the power of the rifle whilst I chose a new stock to swap for the one it came with. I met Tracey at Hogan Firearms and she showed me to the shelf with all the Thumbhole stocks on and said she'd gone through them to find the best to which she had put to one side. I looked at each one and saw some great stocks but then I saw a nice darker version and I like dark walnut so thats the one I picked. I then watched (avidly) as Tracey and another guy (seemed like a young apprentice)started to remove the anti tamper and proceeded to adjust the power output and then after some fine adjustments and some 200 shots through a chrono, I left happy that the power was increased a little. (But still not enough for me ) The rifle was outputting bis mags at 11.5 ft lbs. But Mossies were still in the 10's. I discussed the warranty with them and asked about the Anti Tamper and they were very open about it and to why they had to put it on. They stated that if I was to remove the AT and the rifle ever came back for a warranty repair/service that I would only be charged for the re-fitment of the AT if it was a repair not applicable to the AT's removal. Thats good in my book and superb customer service. I left the factory a happy bunny. I decided to remove the anti tamper as it is still legal to do so (I wont go into the details how mods, so dont worry, but I told you I watched them at the factory avidly ) and tweak the power output up a tadge to enable the rifle to shoot my beloved mossies at closer to the normal legal limit (805 fps) but not close enough as to worry about a heavier pellet taking it over. After a session with Jay T's Alpha Chrony and a few 20 shot strings, the power was set and consistency checked. Consistency was about average for an unregged rifle and on par with my GML which means good to me. Job done, now I am a happy bunny. Back to the trigger. The standard trigger blade is rather uncomfortable compared to the match trigger supplied and seems set back just a tadge too far and is un-adjustable in this area which is bad in my book but not the end of the world. The match trigger is much better but again is set slightly too far forward. I will be doing a slight modification on the trigger soon. The trigger settings straight from the factory are actually quite good and once I got used to the blade the long 1st stage and crisp second stage seemed rather good and actually just as good as my GML's heavily tuned trigger. Now there is another reason the deal I got was good. This made the deal even better. During the month of May, if you purchase a Ripley Elite, Highland Outdoors will send you a scope and mounts worth £255- £300 quid absolutely free......gratis. Wow what a deal and I didn't even know about that when I ordered the rifle. 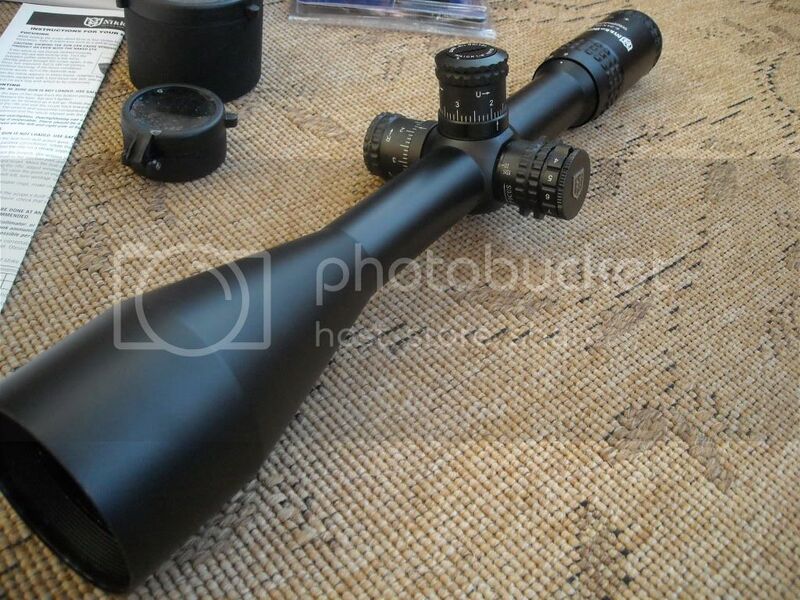 I had to wait a week before the brand new Nikko Target Master 6-24 x56 scope came and it was a really nice scope, complete with mounts and sunshade and illuminated ret etc. Superb quality and optics to die for but not for HFT so for sale it went and that reduced my outlay for this rifle even more. Someone got a great hunting scope for quite a bit less than buying one new. So onwards and upwards we go and it's time to actually shoot the rifle. I tried to zero the Ripley last weekend at my HFT club but it was too windy. Fine for up to 20 yds but far too breezy for anything further so the rifle went back in the gun cupboard and I used my GML at the Anston Nefta Hunter round. I still love my GML and would never sell it and it earned me another gold badge at the comp. Good old reliable GML. This week, again off to the club and attempt to zero but again it was windy with gusts of 7-20 mph and occasional gusts going much higher. But I managed to zero it pretty good and obtained reasonable groups at 40 yds and one holers at below 30 yds and ragged groups at 30 (my preferred zero). So myself,Jay and Al decided to do a round of our laid out HFT course and see how we would do in this gusting wind on what is to be honest quite an extreme HFT course with many mini kills and donut inviting head kills at long distances. My zero was obviously not good enough and together with bad wind (the weather type ) estimation, I scored a lowly 47 out of 60. Dissapointed but not giving up, we had a coffee and decided to go out again. But first I re-zeroed on the range and did some minor adjustments to the Bushnell Elite 3200 10x40 that I have mounted on the Ripley. (I also have the same scope on my GML). This time the RIPLEY was superb. This is a rifle with less than 400 pellets through it and I scored a fantastic (for me) 56 out of 60, beating Jay and Al for a change. It will get better the more lead is put through it no doubt. The rifle handled superbly and put the pellets exactly where I wanted them. Later on, as a test I shot a stander at 35 yds 6 times out of 6 and that is good for me, honestly. The balance of the rifle is ideal for me. I love traditional stocked guns and always feel more comfortable with them compared to out and out competition rifles but not everyone is the same. We went out a third time and I again scored quite highly with a 54 in even stronger winds. I'm rather chuffed with this little Ripley Elite and I think it will be a worthy bedfellow to my trusty GML Hunter. I only have two precharged air rifles and for me, my two are just perfect..........well for now at least. I like the Ripley and I guess you know that by now if you have read the above. It balances well for me, shoots superbly and looks the business as far as I am concerned. Not everyone likes them, they are still pretty rare and that is another attraction for me too. I hope that this review helps others who are thinking about purchasing a Ripley Elite to make their minds up. 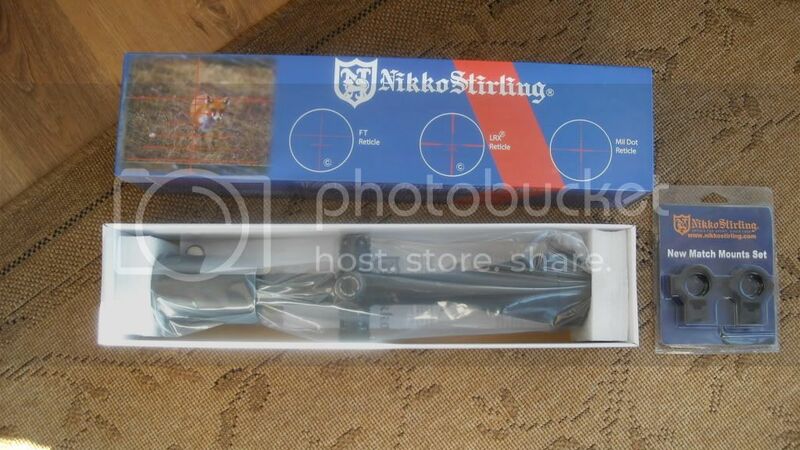 These are nice British air rifles from a company looking to establish itself and I think they will. 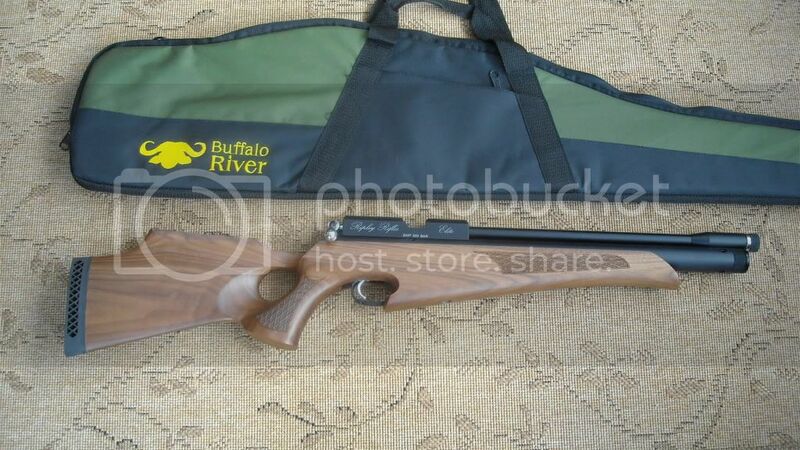 Yes they dont have the resources of Daystate or Air Arms but they do have a passion to make good air rifles and I think they have succeeded. 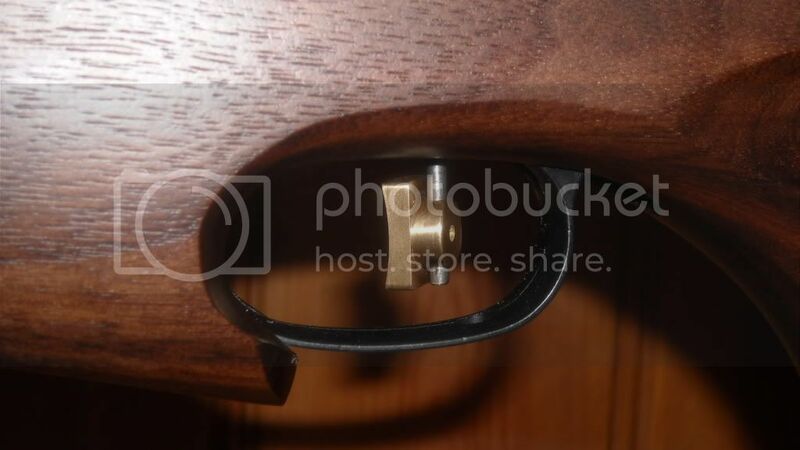 i want to fit the match trigger to mine but no manual came with the gun, can anyone advise or give me a link to a pdf?